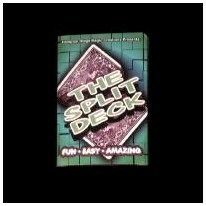 The magician shows a deck that has been cut in half diagonally. The cards for both halves are fanned face up to show they are mixed then turned back face down. A spectator then each select one card from the first half of the deck, and a second spectator selects a card from the second half of the deck. Amazingly, when the selected halves are put together and turned face up they match to form a complete card! A baffling effect!